Fosamax is a prescription drug to treat osteoporosis. It is also used to treat individuals who have Padget’s disease, which is an abnormal formation of bone. Fosamax (bisphosphonate) is manufactured by Merck and is used to bring bone remodeling into balance by slowing down bone loss and allowing bone growth to continue. The Food and Drug Administration (FDA) was forced to issue a Fosamax Warning to healthcare providers about Fosamax Femur Fractures based on early reports of complications with patients. 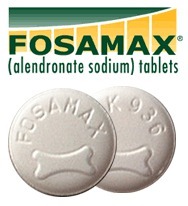 Other Fosamax side effects requiring a further Fosamax Warning include muscle and bone pain and osteonecrosis of the jaw (ONJ) as well as esophageal irritations. One study published in the Clinical Orthopedics and Related Research, supplied evidence on women who had experienced Fosamax Femur Fractures after taking Fosamax therapy for 5 years. X-rays were published demonstrating unusual transverse Fosamax Femur Fractures. These Fosamax Femur Fractures were reported to occur with low impact trauma that occurred from a standing or sitting position. After discontinuing use, one patient was able to heal without surgical treatment but the other patients required surgical intervention and physical rehabilitation to gain lost function. A study at Columbia University reported on over 100 women who were taking Fosamax and its generics. This clinical study demonstrated that patients had improvement in their bone structure during short-term therapy but with long-term therapy, bone structure began to weaken. Other studies in New York at the Hospital for Special Surgery also reported a decrease in bone structure after 8 years of therapy. These reports indicate that Fosamax and its generics act more a bone hardener and not as a bone builder making bone more brittle and more easily broken generating Fosamax Femur Fractures necessitating a Fosamax Warning by the FDA. The Food and Drug Administration (FDA) has recommended that Merck update the Fosamax Warning portion of the prescribing information to include these risks. The FDA has also notified healthcare providers and Fosamax users of each Fosamax Warning. The FDA continues to review medical studies to see whether further Fosamax warnings are required. In March of 2010, the FDA issued a report that the agency is planning to conduct a safety review of this osteoporotic drug. This safety review was scheduled after increasing reports of Fosamax Femur fractures. Further reviews are also being conducted for other Fosamax side effects that include musculoskeletal pain, osteonecrosis of the jaw (ONJ) and esophageal ulcerations. If you have experienced Fosamax Femur Fractures or any other related illness while taking Fosamax therapy you may consider consulting with a Fosamax attorney so that you may be informed of your rights. Fosamax lawsuits are currently being filed across the country. Call us now at 877-222-7069 or use the contact form for a free case review.